Bacchus is designed for the ultimate charter vacation. The Bacchus swim platform was extended by 4 ft in 2016. Bacchus 146-foot yacht is fully equipped to inspire the vacation of a lifetime. Step aboard Bacchus and enter a world of romance, adventure, celebration and relaxation. An eight-person Spa Pool with Built-In Settees offers Panoramic views. Spacious sundeck and professional crew. A tribute to the God of Wine, Bacchus is designed for the ultimate charter vacation. An impressive complement of watertoys. Adventures above and under the water. 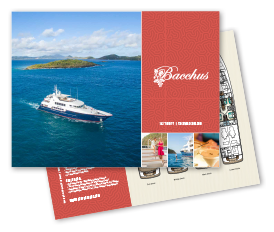 Your charter itinerary aboard Bacchus will be carefully outlined to your preference. Bacchus invites guests to let the celebration of life, love and family begin.